As the summer season is in full swing and many of us are enjoying long weekends by the lake, one of The Center’s clients is taking his travels in a different direction. 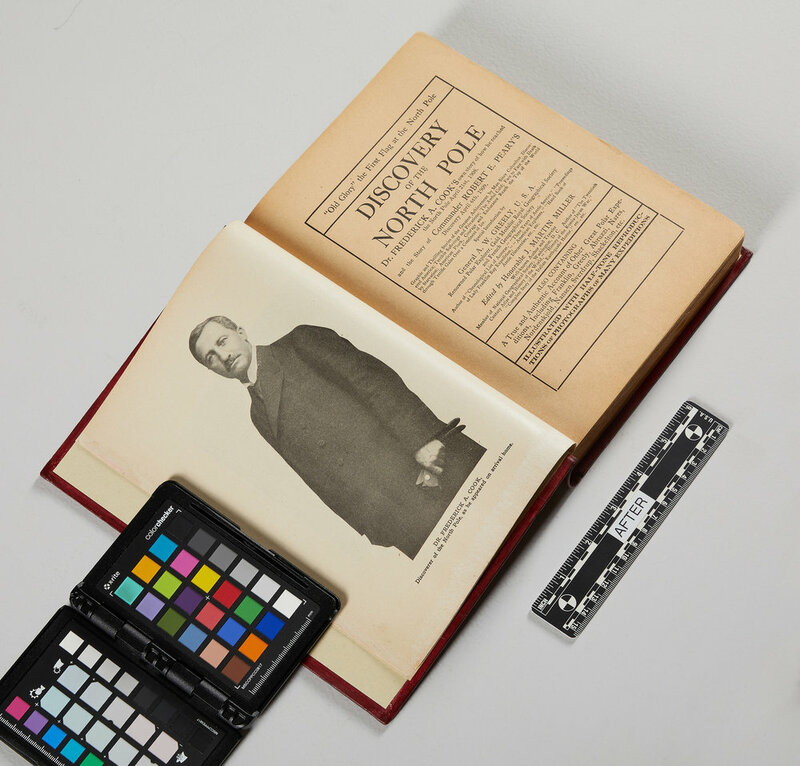 William Hartel, longtime client of The Center and an avid collector of rare books, recently contacted our conservators regarding the conservation of several books he purchased to take with him as travel companions on his summer journey to the North Pole. 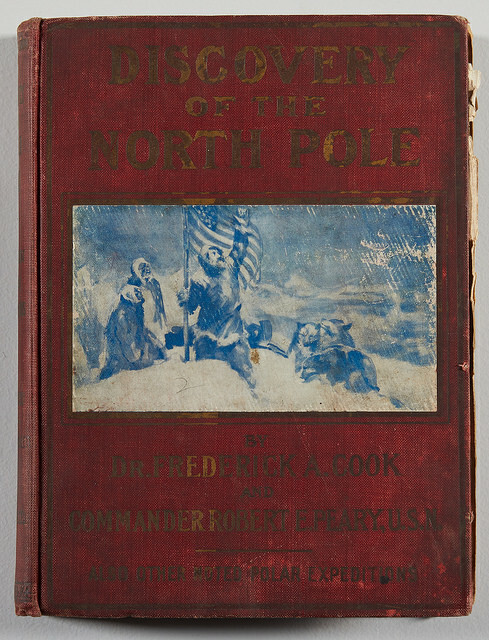 The works were two of the original copies of the 1909 publication “Discovery of the North Pole”, written by Frederick A. Cook with excerpts by Commander Robert E. Peary. After some research on the two men, we learned that they both announced their discovery of the North Pole within a few weeks of each other. Peary malevolently sought to disprove Cook’s claims and eventually received recognition as the first man to arrive at the North Pole. However, both accounts were reexamined in 1988, and while Cook’s claims were never proven, they were never disproven. Peary’s claim was also given its doubts. Nonetheless, Cook wrote about his journey through the icy unknown in his diary, which would later become copied and printed in the books that were sent to The Center. 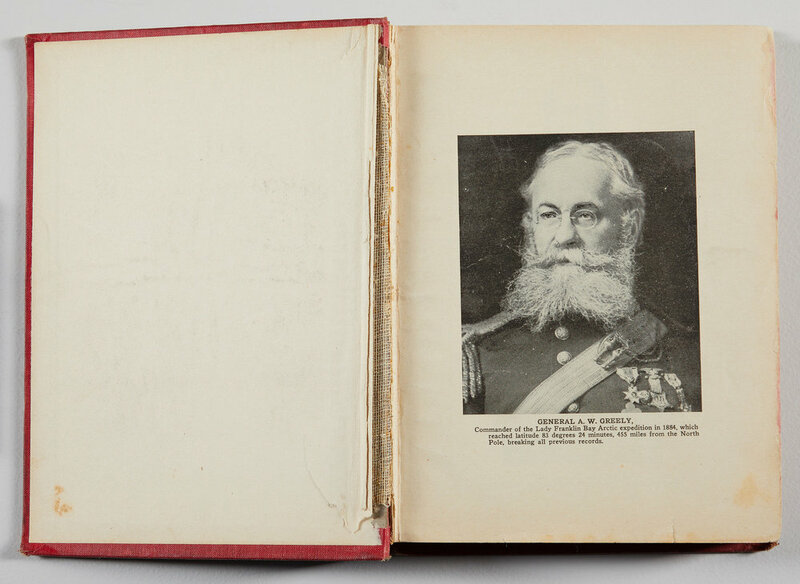 The pastedown page of the book includes a photo of Cook upon his arrival home, and is proudly captioned “Dr. Frederick A. Cook, Discoverer of the North Pole”. The two copies of the book that came to us both exhibited gold stamping on the front cover and spine. The front section of the texblocks were loose, but the endcaps were present. The books exhibited some paper damage to the pages and plates throughout, and the case hinges were intact but weak. The pages in both books were brown and brittle, and the front flyleafs were missing. One of the book’s textblocks was completely detached, and the others was sitting loosely in its case. 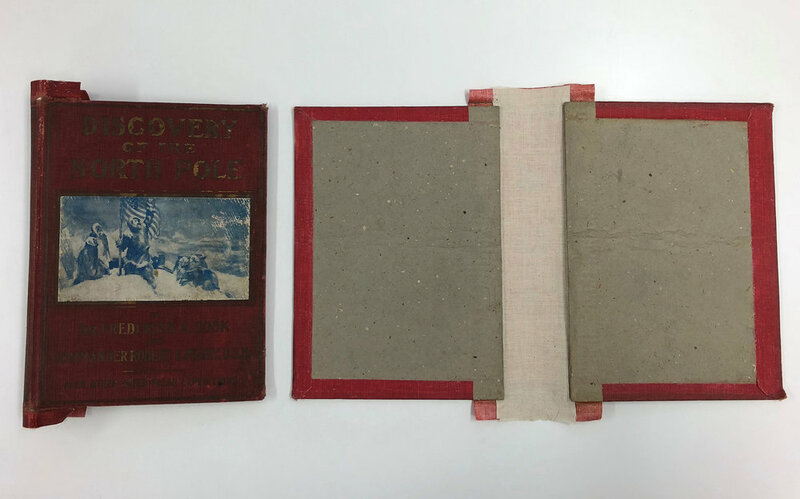 Our Book Conservator began her treatment by repairing the damaged pages with Asian tissue and paste. Next, she sewed the loose front sections to the body of the text block and added new flyleaves. The spine of the textblocks were then reinforced with linings and hinging material. The case hinges were reinforced, and the text blocks were hung in their original cases. Just in time to embark on their travels, the books were carefully surface cleaned, wrapped, and returned to our client. Like their author, these books have been on quite the journey.